As posted at Whitby This Week, November 26, 2014. Shelley Herder, a teacher at Winchester Public School, exemplified the spirit of volunteering on her recent trip to help children in Sri Lanka. Sri Lanka experienced more than 25 years of violence in a civil war which recently ended when government forces seized the northern area of the country. Through an organization called Sleeping Children Around the World, and at their own expense, Ms. Herder and five other Canadians volunteered to deliver bed kits to 4,000 of Sri Lanka’s neediest children. Ms. Herder and her team were helped by the local Sri Lankan Rotary Club, which provided a bus and aided with translations. Sri Lankan teachers were asked to nominate children between the ages of six and 12 who were most in need. Each child received a bed kit consisting of two sets of locally made clothes, a backpack, mosquito net, water bottle, pillow, pajamas and paper scribblers. Bed kits are made possible by individual donations of $35. Each donor receives a picture of the child they helped along with a tag showing the donor’s name. Ms. Herder heard about the program last year when Canon Susan Sheen visited St. Thomas Church in Brooklin and shared experiences about her trip to Bangladesh. SCAW is completely run by volunteers and 100 per cent of all donations reach the children, an important aspect of the program for Ms. Herder. She explained that to avoid advertising costs, the only form of promotion is for volunteers to share their stories. Thank you for sharing your story with us. For more information on Sleeping Children Around the World or to donate a bed kit, contact Shelley Herder at nanaherder@gmail.com or visit www.scaw.org. With Christmas on its way there are programs close to home that can also use a little help. The Brooklin Christmas Hamper program is happening again this year and organizers are looking for volunteers or donations for local families. Contact David Jacob at david.jacob@markhamcruise.ca for more information. Thank you to everyone for sharing your many stories and events from around Brooklin. If you have a story or upcoming event, please e-mail me at news@hometownmusic.ca . 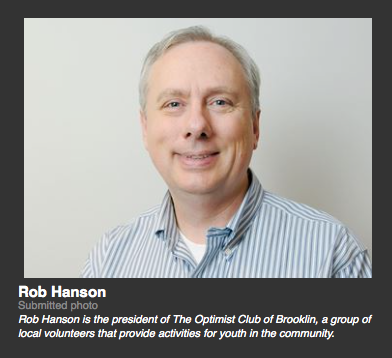 Rob Hanson is the executive director for the Hometown Music Council, workshop director for Brooklin’s Mini Idol and a director for the Brooklin Spring Fair.